Salman Rushdie is the author of thirteen novels: Grimus, Midnight’s Children (which was awarded the Booker Prize in 1981), Shame, The Satanic Verses, Haroun and the Sea of Stories, The Moor’s Last Sigh, The Ground Beneath Her Feet, Fury, Shalimar the Clown, The Enchantress of Florence, Luka and the Fire of Life, Two Years Eight Months and Twenty-Eight Nights, and The Golden House. His fourteenth novel, Quichotte, is forthcoming from Random House in the Fall of 2019. Rushdie is also the author of a book of stories, East, West, and four works of non-fiction – Joseph Anton – A Memoir, Imaginary Homelands, The Jaguar Smile, and Step Across This Line. He is the co-editor of Mirrorwork, an anthology of contemporary Indian writing, and of the 2008 Best American Short Stories anthology. 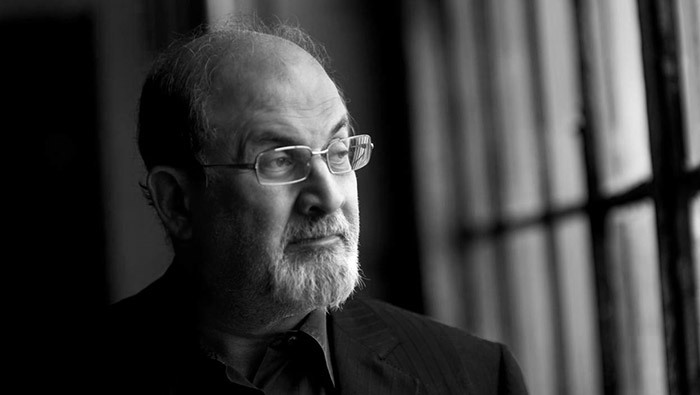 A Fellow of the British Royal Society of Literature, Salman Rushdie has received, among other honours, the Whitbread Prize for Best Novel (twice), the Writers’ Guild Award, the James Tait Black Prize, the European Union’s Aristeion Prize for Literature, Author of the Year Prizes in both Britain and Germany, the French Prix du Meilleur Livre Étranger, the Budapest Grand Prize for Literature, the Premio Grinzane Cavour in Italy, the Crossword Book Award in India, the Austrian State Prize for European Literature, the London International Writers’ Award, the James Joyce award of University College Dublin, the St Louis Literary Prize, the Carl Sandburg Prize of the Chicago Public Library, and a U.S. National Arts Award. He holds honorary doctorates and fellowships at six European and six American universities, is an Honorary Professor in the Humanities at M.I.T, and University Distinguished Professor at Emory University. Currently, Rushdie is a Distinguished Writer in Residence at New York University.